The problem, related to the "quantum Hall effect," was first proposed in 1999 as one of 13 significant unsolved problems to be included on a list maintained by Michael Aizenman, a professor of physics and mathematics at Princeton University and the former president of the International Association of Mathematical Physics. 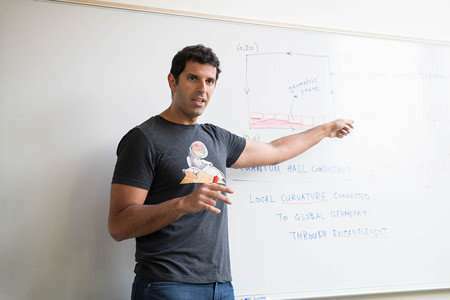 Michalakis started working on the problem back in 2008 at Los Alamos National Laboratory, where he was a postdoctoral scholar in mathematics. He built his research on pioneering work by Hastings, his advisor at the time, who had developed new mathematical tools for scrutinizing the quantum Hall effect, based on decades of research by others. Michalakis says that reading through all the previous literature proved almost as challenging as solving the problem itself. The Communications in Mathematical Physics paper describing the solution is titled "Quantization of Hall Conductance for Interacting Electrons on a Torus." Matthew B. Hastings et al. Quantization of Hall Conductance for Interacting Electrons on a Torus, Communications in Mathematical Physics (2014).